When it comes to choosing which soldering gun to purchase, it can seem overwhelming and confusing. With so many choices available, we need to consider a soldering gun which provides us with amazing value for our money. For instance, Weller D650 Industrial Soldering Gun has been designed for easier than ever at home use, but has the quality of a professional soldering gun. With the latest technology of soldering guns, it has become easier and simple to operate a soldering gun, right in the comfort of your home. Set aside all the false assumptions that it is difficult to own and operate a soldering gun, and begin working on those not so daunting home projects with our easy, valuable and user-friendly soldering gun picks. The Weller D650 Industrial Soldering Gun has the highest power output amongst all of the Weller products. It is recognized for its reliable industrial quality and 200 or 300W heavy-duty dual heat features. Our runner-up, the Wall Lenk LG400C 400 150 Heavy Duty Watt Soldering Gun features dual wattage elements. It has a trigger activated control which provides you with easier, more convenient and quick response results. As an added feature the Wall Lenk LG400C has a large 1-inch light which illuminates your work area allowing you to operate even in poor lighting. Our budget pick is the Weller WEL8200PK 120 Volt Universal Soldering Gun Kit, which is a universal all-purpose soldering gun that is not too expensive. It has a pistol-grip design, dual heat and a built-in light illuminating your work space. A soldering gun is considered a power tool and is designed to look like a pistol. They are generally used for adhering surfaces together, such as, metals, electrical applications, wires, circuit boards and various other projects. Soldering guns are not the only soldering tool in its market. The other soldering tools that belong to the family of soldering guns are iron, pencil, soldering station and torch. These electrically controlled devices contain a powerful mechanical attachment and a trigger-style switch for easier single-handed use. 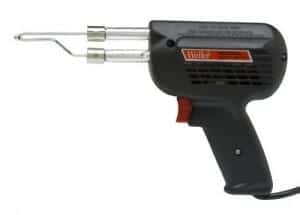 Soldering guns are used for a variety of soldering projects, a few include heavy duty electrical connections, stain glass assembly and sheet metal work. Generally, a standard soldering gun have a 100-240-watt power. The tip of the soldering gun is created by a loop of thin copper wire and secured to the end of the secondary transformer with screws, which creates the secondary circuit. The copper tip heats up quickly through the several hundred amps of current flow when the primary transformer is energized. Although the loop copper wire heats up rapidly, it also cools down very quickly, as a result it is recommended that you should not use the soldering gun for more than thirty second intervals. Soldering guns contain two trigger positions so that you may set it on high or low. Most at home soldering work requires low trigger position, unless you are constructing a heavy duty item. When trying to control the tip of a soldering gun, you must do this manually by holding the button until you have melted your material and then release the button. This step is repeated until you have reached the desired outcome. As mentioned, a soldering gun can be used on a variety of surfaces, however, keep in mind that if too much heat is applied to the surface you may cause some damage. Also, the tip of a solder gun wears down over time and will need to be replaced. As a caution, always ensure that the tip has not attracted any small metal pieces, due to the high magnetic field is possess. In addition, you must check the screws which hold the loop in place as these can become loose which in turn affects the resistance. As mentioned soldering guns belong to a family of other soldering tools. Each soldering tool serving the same purpose of adhering surfaces together. However, they will not perform the same, as it depends on the demands of the soldering job you have. Whether it is light weight or heavy duty, will be the deciding factor on which of these soldering gadgets you need. Here are the different types of soldering guns. This is the most popular in its soldering family due to the fact that they are the most versatile. It is user-friendly and most individuals prefer to use the soldering gun because it has an easy to grip handle. Furthermore, users of the soldering gun enjoy using this tool because it contains a convenient trigger mechanism. As we mentioned, the soldering gun possess a loop wire copper tip which is designed to rapidly cool, as a result eliminating the use of a holster. Due to this rapidly cooling feature of the loop wire, you don’t have to stress about fire hazards, this allows for easy and safe storage of the soldering tool. A soldering torch, such as the Dremel 2000-01 Versa Tip Precision Butane Soldering Torch, is generally used by jewelers because it is intended to melt precious metals that require above average heat such as, silver, gold and copper. They are also used by word workers who desire quality wood burning torches. These types of soldering tools are powered by propane gas or acetylene which result is great level of heat in short bursts. Generally, soldering torches are not recommended for novice users and are usually used by electrical professionals. Keep in mind when using a soldering torch special clothing and a flame resistant work space is best. Soldering irons are the most commonly found tool in its category. It is held like a pen and provides you with a power rating between 15-35 watts, which is more than sufficient for the simple electronic repair job. This being said, it is not ideal for larger soldering jobs due to it small size. These types of soldering tools have self-regulated tips, which means that as the temperature rises the resistance of the tip surges. Unlike soldering guns, the irons can be used for longer periods of time. Since the tip of the iron are solid, this means you can just file it down when they become worn or pitted, allowing you to use it over and over again. Deciding on what your purpose is for a soldering gun will make your purchasing decision much easier. The first thing you need to decide is whether you require a soldering gun, iron, torch or would rather purchase a soldering kit. In order to determine which of these soldering tools you need, you must consider what you will be using these tools for. For instance, is soldering a hobby of yours or are you a skilled professional who desires a soldering tool that attains high-end features? Also, is your soldering project large or will you be using it on precious metals? Once you are able to answers these questions, then you will be able to determine which soldering gun you need. For instance, if you are an individual looking for a soldering gun/tool which you can operate on large or industrial projects, then the best choice is to purchase a soldering gun. On the other hand, if you are performing smaller scale jobs or are a hobbyist solder, then you are better off choosing a soldering iron or low wattage soldering gun. Soldering torches are ideal for the solder who are more experienced, jewelers or word workers. When it comes to purchasing a soldering gun there are a few factors to consider. Although it is recommended that a new user start off simple, it is not difficult to learn the art of soldering and come become an integral tool in your home. It can be daunting when researching for a soldering gun, however, when it comes to the brand of this tool you should select a brand which is well known. For example, Weller is a well-known brand in this market and you can be sure that selecting either a Weller product or another popular soldering brand, that you are bringing home a quality product. Also, purchasing from a major brand ensures that you are buying an item that was designed with durability and longevity. In addition to the brand type, another factor to consider is the wattage. The wattage of a soldering gun will provide you with the necessary heat for various objects. However, if the heat is too high than this can damage your object. Generally, most home soldering kits are 15-35 watt whereas a professional soldering tool can go as high as a 300 watts. Now that you have considered the brand and wattage factor, you should research the temperature control features. Some of the more advanced soldering guns come with a method of controlling the temperature and/or a thermostat which will automatically turn off/on the power. Professionals will generally use a temperature controlled soldering gun for more delicate soldering projects. Although the price of a soldering gun is not highly expensive, budget is still a factor to consider. Some individuals may not want to spend a lot of money on a soldering tool, especially if they are doing it more as a hobby. Luckily, soldering guns or tools range anywhere from twenty dollars to a couple hundred dollars. With these factors, choosing a soldering gun which best suits your needs is much easier. Although the Wall Lenk LG400C 400 150 Heavy Duty Watt Soldering Gun is our top pick for a soldering kit, the Apex Tool Group D550PK Professional Soldering Gun Kit is a stiff competitor. Apex has become a very well respected brand both for professionals and non-professionals. This kit is designed for the professional solder however; it can be used by the novice user with equal success. The Apex Tool Group D550PK Professional Soldering Gun Kit is designed with a pistol grip which provides you with ultimate comfort and ease of use. It also, has a fingertip trigger that allows you to select a high (260-watt) or low (200-watt) for controlled output. In addition, this kit comes with a variety of accessories in a molded plastic storage case, which means easy portability of your soldering gun and its parts. This soldering gun kit is designed to heat up rapidly (within six seconds) and contains two lights on the soldering gun which is great for illuminating your work space. This well-known soldering kit is a great alternative to our top pick soldering kit. It will provide you with impeccable results you desire, constructed with durable materials and will last you years. When it comes to stain glass soldering, there are many choices of soldering tools available. However, there is only one desired product by many stain glass solders, the Hakko FX601-02 Adjustable Temperature Controlled Soldering Iron. The Hakko FX601-02 is durable with a cord strain relief design. It also has an adjustable electronic temperature control and its sensor ensures delivery of consistent heat. You will love the ergonomic and slender design of the hand piece, making this soldering iron easy and comfortable to operate. Many of the reviews stated that by far that the Hakko FS601-02 Soldering Iron was the best for stain glass projects. Providing details that the heat up time took no longer than 11 seconds and that the tips where easily changeable to suit each solders needs. The Weller D650 Industrial soldering gun is one of the best and most reliable industrial product in the Weller collections. It also has the highest output power when comparing to other Weller products. This is a dual heat gun that produces 200-300 watts. It has been designed with a housing that is heat resistant made of thermoplastic, as a result ensuring your safety during usage. In addition, the Weller D650 features an incredible fingertip heat selector switch, has a two wire heavy duty cord and amazing insulation to protect you from nasty accidents. When you purchase a Weller, you will discover that there are no limits of which soldering jobs you can perform. It is lightweight and ergonomically designed for comfortable and ease of use over a long period. Its slender tip allows you to get into various small areas, but also enables you to work on larger projects. The Weller is ideal for all types of solders, from the novice to the professional, really making this the all-time favorite soldering gun. It is expected that when we dole out our hard earned money on a product, that it should be 100% perfect. However, we all know this is very unlikely and that there are always a couple flaws in the product, or lacking desirable features. Just like any product, the Weller D650 Industrial Soldering Gun does have a few flaws, however, these flaws when reviewed do not classify as deal breakers. For instance, although the Weller is suited for a variety of soldering jobs, it has been noted that it is not ideal for circuit board soldering projects. Unless, this is your major soldering job, then really this is not a sufficient reason to overlook the Weller, considering how many other solder jobs you can perform with it large or small. Another slight flaw with the Weller, is that the screws will loosen over time. This is no different than any other product we buy. Over a long period of continuous use of a product the item can become loose, however, this an easy fix. All you need is a screw driver and a couple minutes of your time to retighten the screws and voila the Weller is once again perfect. Also, this soldering gun does have a carry case which would have been a desirable thing to have so one can store and transport the gun easily. However, it has been noted by many reviewers that the cardboard box it arrives in is heavy duty and does the trick. Another option is to purchase a tool box for the soldering gun at any hardware store or create a hook on the wall to hang it. If you are searching for all the bells and whistle in your soldering gun, then this is the soldering gun for you. The Wall Lenk LG400C is the ideal soldering gun for any job, large, medium and small. The tip reaches a maximum temperature of 1000 degrees Fahrenheit, which is perfect for performing effective heavy duty, sustained soldering. Another favorable feature is the dual wattage element. The higher wattage (400W) heats up the tip rapidly and the lower wattage (150W) remains rated tip temperature. Furthermore, this soldering gun provides you with instant response, convenient control and is very easy to use. It also, has a large 1-inch built-in work light which illuminates your working station, allowing you to perform your soldering jobs even in the poorest of lighting. As an added bonus, the Wall Lenk LG400C comes with its own carrying case, which makes this easy for storage and portability. As mentioned, Weller is a very reputable company and are known for their design of durable and heavy duty quality tools. This soldering gun kit is no exception, even at its low cost. It is ideal for the hobby solder or the more skilled solder. No matter the level of experience, you will not be disappointed with the Weller WEL8200PK soldering gun kit. The Weller WEL8200PK is constructed from solid materials, which means that it will last for many years. Its pistol grip design makes it easy and comfortable to hold, and allows you the precision needed to perform a soldering job like a professional. In addition, this all-purpose soldering gun features dual heat that produces 140W or 100W and a fingertip trigger that allows you to select a high or low output. Furthermore, it has a heavy gauge, high efficiency tin platted copper tip and with its quick heat time of only six seconds, means you can start your soldering jobs immediately. In this soldering gun kit you will receive the 120V Weller 8200, three tips and a blow molded carrying case, allowing for easy storage and transport of your soldering gun and its accessories. It also has a twin lights which will illuminate your work area. You can feel confident when you purchase this soldering kit as it offers a 7-year warranty and is designed by one of the leading brands in its market. This is a high quality product that provides you with all the latest technology. It consists of a hot air gun (500W metal heater), soldering and a de-soldering gun. The soldering iron comes with a smoke absorber and offers 70W which is ideal for lead free alloys. The de-soldering gun comes with zero crossing circuitry which prevents electrical surges and a strong suction vacuum pump. The AOYUE is so easy to use, just screw on the nozzle to the hot air tool, apply hot air to begin melting the solder and then lift the tool from your project using the vacuum feature pickup. It also keeps a consistent set temperature once the set and the value are reached. On the front panel of the station you will find a touch control all-digital display for temperature and pressure. In addition, this unit is lead free compatible with a compound tip design by connecting the ceramic heater, tip and sensor control as one. Due to the style of this tip, you will find that the tip will heat up quite rapidly. An added feature is the auto cool-off process which leaves the blower on until the nozzle is cool. As a result, this enables a long life of your soldering tool and ensures your safety. Also, the nozzle on the AOYUE soldering station is compatible with various nozzles types from other manufactures, making this easy for replacements and allowing you to shop around for the best price. There are many soldering irons in the market. Constructed of stainless steel and iron platted tip ensures that their product and the properties are sustained and reliable. It features a steel-pipe design for more efficient heat dissipation and will aid in reducing the temperature of the handle. As a result of this handy feature, you will avoid the plastic from melting due to the heat. It also has a temperature control with a special thermostat circuit which allows you to control and adjust the temperature according to your needs. This soldering iron has a Chip Fixed Resistor that will assist in getting the iron tip hot much quicker which enables for better heat dissipation efficiency, providing you with a more stable quality tool. This soldering iron has a soft grip design giving you a more comfortable soldering experience. You will receive five different tips, soldering stand, solder wire, de-soldering pump and anti-static tweezers. This soldering iron kit will provide you with the ability to perform various soldering jobs, just plug it in and start soldering. Although we have provided you with our top three picks when it comes to soldering guns or soldering kits, there are a couple of worth mentioning contenders. Here are the two contenders. This electronic solder has an adjustable temperature control, six soldering tips, a stand and solder wire. In addition, this durable 60W soldering iron provides you with a temperature range from 200-400 degrees Celsius. It also comes in a convenient carry case for easy storage and portability. The Mudder is ideal for wood burning projects or small jobs around the house. Keep in mind that you should not leave the machine on for extreme periods of time, as it might cause damage to the product. This is a medium-duty soldering gun with a built-in spotlight to illuminate your work space. It has a balanced handled design for easy use and comfortability. The Wall Lenk WG991KCS soldering gun tip heats up within ten seconds with a maximum of 800 degrees Fahrenheit temperature. It also comes with a stand which will ensure that you are out of harm’s way. This soldering gun is ideal for various soldering applications, such as electronics, hobby and smoothing/cutting. You will receive 150/100 watt, 120vac, two wire soldering gun, three soldering tips, half ounce lead free solder and reusable packaging. Owning a soldering gun can be exciting, especially for the individual who loves to repair electrical objects at home. Although it may seem scary operating a soldering gun it is not as difficult as it seems. The top rated soldering gun picks we provided you will make any soldering job seamless. Whether you are a skilled solder, hobbyist or a total newbie, when you own a soldering gun you have the ability to repair or create various soldering projects. As mentioned throughout this article, there soldering guns and other soldering tools which are best suited for each individual. For instance, a jeweler may prefer a soldering iron, whereas a professional electrical repair man will require a soldering gun. When planning to buy your soldering gun, keep in mind what your purpose is, the factors to consider and off course your budget, although our top picks are reasonably priced. Whatever the solder project you have planned, our top picks are a sure choice for you.